Explore the historical centre of the iconic city of Florence, the Capital of Tuscany that boasts an historical-artistic legacy known throughout the world. Its historic center is a living archive of both European and Italian culture, and your english speaking guide will lead you to discover its unforgettable highlights: Florence Cathedral of Santa Maria del Fiore and its Brunelleschi’s dome, the Baptistry Doors by Ghiberti. See the Palazzo vecchio, dominating Piazza della Signoria, symbol of the power of Florence during the medieval times and Renaissance and close to it the Loggia della Signoria, an authentic open-air art gallery. Adjacent to Piazza della Signoria, you’ll see the building of Uffizi, hosting the famous art gallery, and its Vasari corridor that leads to the famous Ponte Vecchio. After meeting up with your group, you’ll start off on your approximately 1.5-hour walk around the city. Your route will vary, but will take in many of the major Florentine points of interest—including The Duomo, the Palazzo Vecchio and Uffizi Gallery, the Baptistery of San Giovanni with its “Gates of Paradise”, Giotto’s Campanile, Brunelleschi’s Dome, the churches of Santa Trinita and Orsanmichele, the Ponte Vecchio, and the secret Vasari Corridor. Along the way, your guide will share with you the fascinating history behind these landmarks—with a special emphasis on the prominent and powerful Medici family, whose wealth and influence over centuries helped shape the city into the cultural and artistic hub it still is today. You'll finish your tour with a traditional aperitivo to welcome you to the city. 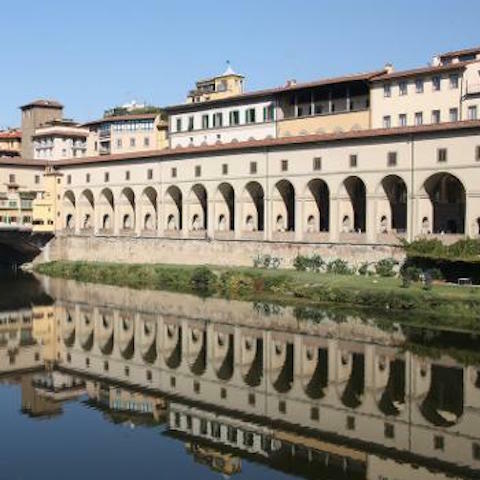 Show & Go Florence Walking Tour with Chianti wine tasting is offered Tuesday through Sundays at 10:00AM. You won't need a reservation to show and go...however we think it important for you to know - it is only offered one time per day! Sunscreen, comfortable clothing and good walking shoes. Many parts of the tour are not shaded.